Minutes away! We're in a movie theater in swish Roppongi Hills, waiting for the Metal Gear Solid 4 press conference, marking the official completion of the title. 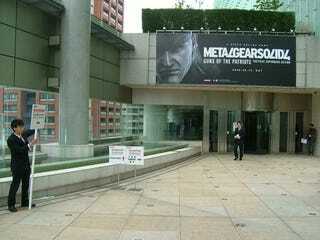 Hideo Kojima will be on hand to talk about the game as well as Sony's Kaz Hirai. Kojima will be playing through MGS4 as well. For forty minutes. On a giant movie screen. Wowzers. Check out the liveblog for all the action!